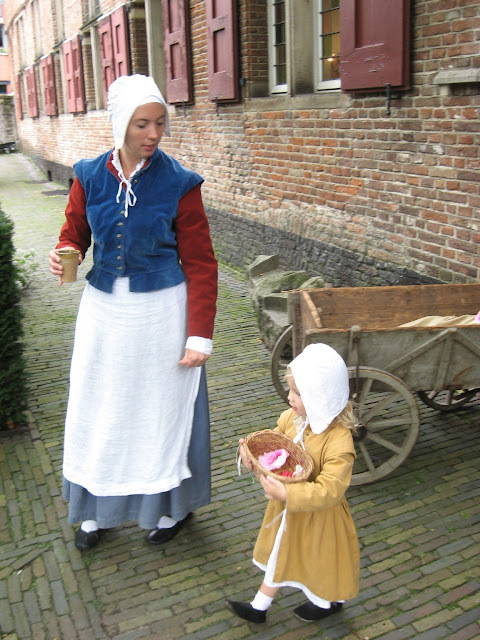 During some weekends people reenact life in a Catholic orphanage in Amersfoort at the end of the 16th century. This is called 'living history'. Amersfoort used to be a catholic town, but during the war of independence against Spain the Netherlands became Protestant. Some towns converted voluntary, some other towns (like Amsterdam and Amersfoort) needed a little push. Any reenactment that I've been lucky enough to see, is so very worth the trip...I thank each and everyone that I've met for keeping our past alive...I have even volunteered to do tours for a private family who once lived on a very popular lake here, and have been lucky to share their life with others...it's truly a remarkable part of life! Great photo you shared too! The outfits are cute. I am curious, how many people take part in these events? Also, what years was the orphanage in operation? Thanks Karen. Actually a lot of people take part, to my surprise. I'll take a closer look next year when they start again with these kind of events. The orphanage was founded Christmas 1550, and it is still in operation! (not by housing kids, but by sponsoring foster-parents).